Baccarat is one of those games that none of your friends really play. They’ve all tried their hand at blackjack. Some at roulette and others at craps. They’re even more likely to have played some of the carnival poker games like Let it Ride and 3 Card Poker than Baccarat. They might have heard of it, but they don’t even know where the table is in the casino — which is somewhat by design, of course. 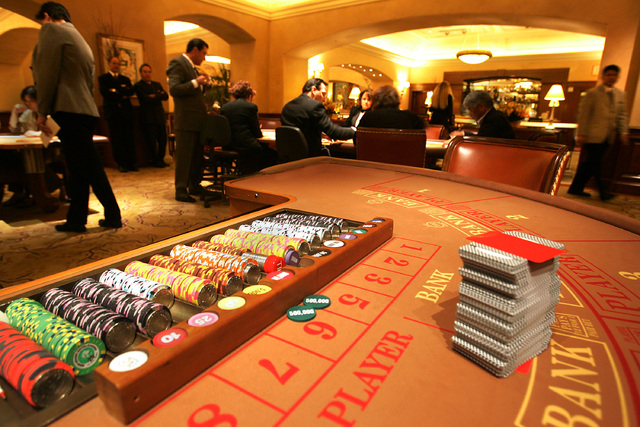 Baccarat tables are usually tucked away somewhere in the casino where only people with personal assistants can play. You might accidentally walk by the Baccarat Room on your way to the bathroom or when you’re stumbling to the elevator. Here’s what you might see: Rich people (mostly Asians) seated at a large table with pieces of paper and pencils calculating what appears to be really fancy and difficult equations and numerals and other math-y things on little sheets of paper. So what are they doing? They’re playing one of the oldest casino games in the world — one that dominates Asian casinos. It’s baccarat (Italian for zero), and it’s honestly one of the easiest games in the casino to sit down and play. Let’s start with the basics. As always, I’ll explain the game as if you have never played it and you feel like walking up to a table to give it a shot. So there you are, walking into the Baccarat Room (or, if you’re looking for lower limits, you’re walking up to a Mini-Baccarat Table on the casino floor), and you sit down and purchase your cheques. Someone may offer you a score card and pencil. Politely decline. You’ll probably get some looks from others at the table. They might even call you a novice (probably in a different language). Ignore them. I’ll tell you why in a bit. Take a look at the table pictured to the right. Let’s say you’re seated in Seat 1. You have three options — bet on the Player, the Banker, or a Tie. That’s it. This isn’t craps with 400 different circus bets. It isn’t blackjack where there’s optimal strategy you should memorize. It isn’t even roulette where you have to choose from 1-36. There’s three options. And really, there’s only two. And hell, if you’re smart, there’s really only one. Before we get too far, let’s just get the optimal strategy out of the way right now. Bet the Banker every time for a small 1.06% house edge. Not too shabby. The Player Bet carries a 1.24% house edge, so it’s your next best bet if you’re feeling like handing the casino your money 0.18% more often. As for the Tie Bet? It’s pretty ugly. Try a 14.36% house edge. Remember those people who judged you for not taking a score card earlier? Some of them are inevitably betting the Tie Bet. Now you get to judge them. Oh, and for the record, those pieces of paper they are meticulously writing on are also worthless. So we’re at this big fancy table. We’ve now got our bet out there. For fun, let’s say it’s a $25.00 minimum bet and we have our little green cheque in the Banker spot. Note that a bet for the Banker is not a bet for the house, nor is a bet for the Player a bet for any person on the table. They are simply names of the two hands dealt. Let’s deal some cards. Similar to craps, the deal will rotate around the table, and that person will continue to deal as long as the Banker continues to win (Note: if it’s a Mini Baccarat Table, there will be an all-time dealer). Two cards will be dealt face down under the shoe and two will be dealt face down to the bettor who has the largest Player bet. The bettor will then look at the Player’s cards and turn them over. The results of the two hands will be announced by the casino dealers. Depending on the results of the cards, there may be an additional card dealt by the dealer as instructed by the casino dealers. Winning wagers will be paid and losing wagers collected. So how do you win or lose? On one hand, scoring rules are extremely easy in Baccarat. On the other hand, there are several little rules that you can either decide to learn or ignore and hope the casino dealers know what they’re doing. Let’s start with the basics. If the Player’s total is 5 or less, then the Player hits, otherwise the Player stands (on 6 or 7). If the Player stands, then the Banker hits on a total of 5 or less. If the Player does hit, then use the chart to the right to determine if the Banker hits (H) or stands (S). Let’s do an example so you can understand the chart. Let’s say the Player’s third card is a King of Hearts (which counts for 0) and the Banker has a total of 3. The Banker must take a hit. However, if the Dealer has 4-7, the Dealer must stand. Often, instead of requiring the 5% commission payment on a Banker bet, the Casino Dealer will keep track of how much you owe in commissions and have you pay it at the end of your session. That’s at the fancy tables, anyway. (2) Similar to craps, don’t jump in during a hand. Wait until there’s a break in play. (3) If you’re playing Mini Baccarat, you can’t touch the cards. (4) If you’re going to splash a bunch of cash on the table, go to the cage first. It slows down play when someone throws $20k in $100 bills on the table. (5) Some players won’t bet “against” other players they know at the table. If everyone is betting Player and you bet Banker, you may get some looks, but don’t feel like you’re going against the table. It’s much more similar to betting Red when some people bet Black in Roulette than playing Don’t Pass vs. Pass in Craps. That said, the most fun tables are those that develop camaraderie in bets. (6) Don’t touch anyone. No pats on the back. No high fives. It’s bad etiquette for some Asian players. (7) If you’re in a real fancy room, there may be a dress code. Seriously. (8) If you don’t feel comfortable handling the cards when you’re the dealer, politely pass the deal. It’s very common. (9) If you’re at a large table in a private gaming room, you will be able to touch the cards if you’re the largest betting Player. Be respectful of the House rules for bending, folding, and flipping the cards. Some casinos allow you to pretty much destroy the cards because they’re only used once. Baccarat is a very simple game. It looks sophisticated. It isn’t. Go give it a try. Don’t let the haters at the table keep you away either. Bet the Banker every time for the lowest house edge. Avoid the Tie completely. Memorize the basic rules to feel more comfortable at the table. Or don’t and just enjoy a simple drinking game.